Diversifying crop rotations is a key strategy used to break pest and disease cycles and improve yields. But in the driest areas of the Pacific Northwest the low precipitation amounts limit the diversification strategies that are feasible. These areas have some of the least diverse cropping systems in the region, often with winter wheat as the only crop. In areas receiving less than 16 inches of precipitation a year, that are generally too dry to support annual cropping, producers rely on summer fallow to retain winter precipitation in the soil profile. Areas where over 40% of the land a given year is fallowed are classified as grain-fallow cropping systems. From 2007 to 2014, only 4.3% of these areas, on average, were planted to another crop besides winter wheat (Kirby et al. 2017). What opportunities exist for diversifying crop rotations in these low diversity areas? In my work compiling the recently published Advances in Dryland Farming in the Inland Pacific Northwest, I learned one answer to this question: winter peas. Most of my background in agriculture is in areas with higher precipitation in the northeastern U.S. and western Washington, so many of the realities of farming in low-precipitation areas east of the Cascades were new to me when I began graduate school at Washington State University in 2009. My vision of crop diversity involved growing crops from a variety of families—grasses, legumes, other broadleaf crops—at different times during the season. Many such strategies aren’t possibilities in the dry grain-fallow cropping systems, hence the low diversity. Since the precipitation needs to be saved for the main crop, growing crops during the fallow year is not an option. Not many crops can tolerate such dry conditions, placing a limit on the options available to farmers. Alternatives for the winter wheat part of the rotation may offer the best possibilities for diversification. And winter pea is one interesting possibility. Winter pea (Figure 1) can have advantages as a replacement for winter wheat in one year of the grain-fallow cropping system because of the reliable market for winter peas and the pea’s ability to fix nitrogen. Though essentially no edible winter pea was grown in the Pacific Northwest prior to 2012, the acreage in the grain-fallow region has increased from zero to 2,730 hectares (approximately 6,750 acres) from 2013 to 2017 (Schillinger 2017). According to Kirby et al. (2017), as more varieties of locally adapted, winter-hardy, food quality (with non-pigmented seed coat) pea cultivars become available, market opportunities will expand. 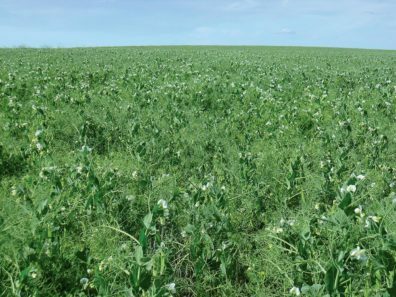 Though high-quality food peas may garner a premium over peas grown for feed, cover crop seed may be the most valuable market for peas. In 2015, in Wilbur Washington, winter peas grown for the food market grossed less than those grown for the cover crop seed market and less than wheat grown on the same acreage. 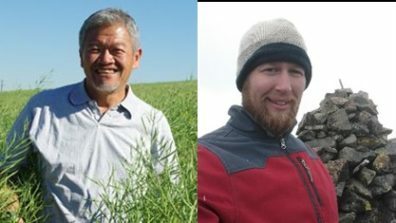 In a 6-year study conducted near Ritzville, Washington, winter pea was evaluated as a substitute for winter wheat in a three-year rotation (winter wheat-spring wheat-fallow) (Schillinger 2017). In this study, winter pea yields averaged 2,443 vs. 4,878 kg/hectare for winter wheat. Gross returns for winter wheat exceeded those for winter pea most years, but growing winter pea resulted in fertilizer savings that averaged $86/hectare, resulting in adjusted gross returns that were equivalent. It’s important to consider the rotation effect: how changing crop rotation affects the main cash crop, which in this region is generally wheat. In the Ritzville study I mentioned earlier, there was a benefit to spring wheat yield (averaging a return of $39/hectare more) after winter pea compared to winter wheat in the three-year rotation. Winter pea uses significantly less water than winter wheat, which can leave more water in the soil profile for future crops in the rotation. The rotation effect offered by winter pea, as well as the opportunity to control grassy weeds such as jointed goatgrass and downy brome, may push the balance of trade-offs toward including winter pea where it precedes spring wheat in a crop rotation. While integrating winter legumes into crop rotations offers benefits, there are still challenges to be worked out around optimal sowing dates and rates, control of broadleaf weeds, winter survival, and sensitivity to sulfonylurea herbicide carryover (Kirby et al., 2017). Winter pea also produces less residue than winter wheat, so is less desirable from a soil conservation perspective. Reading Advances broadened my perspective on what constitutes diversification in these areas where options are limited. Since the grain-fallow area constitutes such a large percentage of cropland in the region (averaging 2.52 million acres between 2007 and 2014), changes made to these cropping systems could have a huge impact regionally. Continued research on alternative crops and the development of markets for these crops is needed to reduce economic risk and make diversification more attractive to producers. More information on winter pea and other possibilities for diversified rotations in the grain-fallow areas, including triticale, barley, lentil, and canola can be found in the Rotational Diversification and Intensification chapter in Advances. Or you can hear the highlights directly from Drs. Bill Pan and Isaac Madsen, in their upcoming webinar Rotational Diversification and Intensification on Monday, November 27 8:00-9:00 am. Kirby, E., W. Pan, D. Huggins, K. Painter, and P. Bista. 2017. Rotational Diversification and Intensification in G. Yorgey and C. Kruger (Eds.) 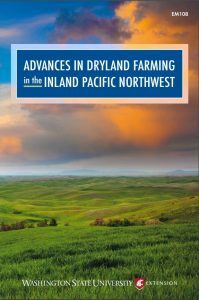 Advances in Dryland Farming in the Inland Pacific Northwest. (p. 163-236). Pullman WA: Washington State University Extension. Schillinger, W.F. 2017. Winter pea: Promising new crop for Washington’s dryland wheat-fallow region. Frontiers in Ecology and Evolution 5:43. A full set of references for the information presented is available in Rotational Diversification and Intensification in Advances in Dryland Farming in the Inland Pacific Northwest.